Can the Catholic Church in Ireland be trusted with children’s education? The self-styled “Moral Monopoly” of the Catholic Church in Ireland persists in spite of a nine year commission into widespread abuse of children in the state funded care of the Catholic Church. Cardinal Brady, the leader of the Catholic hierarchy has avoided accepting accountability for the institutional abuse of children through an absolute abuse of power. Commentators have compared the pervasive abusive behaviour to the treatment of Jews in concentration camps. The 2,600-page report of the Commission to Inquire into Child Abuse http://www.childabusecommission.ie/ painted the most detailed and damning portrait yet of church-administered abuse in a country grown weary of revelations about child molestation by priests. The investigation of the tax-supported schools uncovered previously supposedly secret Vatican records that demonstrated church knowledge of pedophiles in their ranks all the way back to the 1930s. 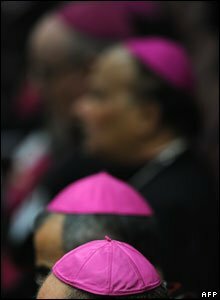 The Ryan Commission Report, a five-volume report on the probe which was legally resisted by Catholic religious orders concluded that church officials shielded their orders’ pedophiles from arrest amid a culture of self-serving secrecy. The Christian Brothers, which ran several boys’ institutions, deemed to have harbored serial child molesters and sadists on their staff, indignantly insisted it had cooperated fully with the probe. Incredibly and with the support and acquiesce of higher authority the order successfully sued the commission in 2004 to keep the identities of all of its members, dead or alive, unnamed in the report. No real names, whether of victims or perpetrators, appear in the final document. The victims were even recently denied access to the conference unveiling the report. the trusteeship of the network of Christian Brothers Schools has been morphed into the Edmund Rice Schools Trust. A government-appointed panel has paid 12,000 survivors of the schools, orphanages and other church-run residences an average of 65,000 Euros each — on condition they surrender their right to sue either the church or state. About 2,000 more claims are pending. Irish Catholic leaders cut a controversial deal with the government in 2001 that capped the church’s contribution to a fraction of the final cost. The Christian Brothers’ leader in Ireland, Brother Kevin Mullan, claimed the organization had been right to keep names secret because “perhaps we had doubts about some of the allegations.” “But on the other hand, I’d have to say that at this stage, we have no interest in protecting people who were perpetrators of abuse,” Mullan said, vowing to “cooperate fully with any investigation or any civil authority seeking to explore those matters.” He failed to detail exactly how this would be achieved. It is important to note that Cardinal Brady, the leader of the Catholic Church throughout Ireland did not intervene to stop the Christian Brothers suing the commission. His failure to do so undermines any moral authority claims from the Roman Catholic Church and confirms the hierarchy’s propensity to keep skeletons hidden from scrutiny. Change is often painful even if it is to improve a situation. The truth of this adage is obvious in relation to the ongoing discussion about the post-primary transfer procedures in Northern Ireland. One of the arguments in favour of the retention of academic selection is parental choice. Choice and free will have been recognised by the Church from the beginning. They are enshrined in many civil Constitutions. Choice and the exercise of free will are desired by people everywhere. It is a matter of justice. However, free will and choice must be exercised within an ethical context. The exercise of free will, in the biblical context, is intended to promote our freedom to choose good, not to suggest an indifference on the part of God to our choice of something which is not good. Is it acceptable to promote and facilitate an unjust and discriminatory system in the name of freedom of choice? Surely the ethical answer to this question is ‘no’. In fact the endeavour to eliminate injustice promotes a society which is more truly free. Injustice needs to be eliminated in order to create the necessary environment for Christian free choice. Academic selection is unjust, in that it facilitates social selection contrary to Catholic Church teaching, and it curtails freedom. In relation to the curtailment of freedom, for example, academic selection eliminates the parental choice of some people in one particular area of a town to send their children to the nearest Post Primary School. We cannot have parental choice for some and not all. We cannot have freedom of choice for some and not all. It is also important to note that an argument based primarily on freedom of choice can be very dangerous. For example, this is the argument that is used by people who describe themselves as pro choice in the debate on abortion. Choice must be exercised in a context which is based on Christian faith and ethics – the free choice of a moral good. The irony of this article, published over a year ago, will be lost on a church which has a propensity, when things go wrong, to describe behaviour as Christian but when imposing a particular denominational view use the term Catholic Church teaching. An example of the moral monoply claimed by the Catholic Church. Parallels may now also be drawn with the Catholic Church’s attitude to being exposed with that of Westminster MPs unmasked in their abuse of the Extra Costs Allowance (expenses) system. When confronted with requests for details using the Freedom of Information Act 2000, Parliament, led by the Speaker, sought to cover-up, obfuscate and threaten legal action against those interested in accountability. Campaigners say ordinary voters are entitled to know what their representatives in Parliament spend public money on. They have accused the Commons authorities of “a plot to conceal MPs’ expenses”. Unlock Democracy director Peter Facey said “The politicians must realise that by behaving so cynically, they will cause great damage to the reputation of Parliament.” The editor of the Guardian said of Martin: ‘He has made the fatal mistake of attempting a cover-up’ Unfortunately the warning was never fully accepted by the Speaker, Michael Martin, who again threatened legal action against the Daily Telegraph when they published detailed information on individual MP’s expenses. Mr Martin will now step down in June 2009, the first Speaker in 300 years to do so. Perhaps a similar campaign will force Cardinal Brady into identifying those priests, nuns and lay members who perpetrated the ultimate breach of trust with the protection of and in the name of his church.